Time flies when your tot is growing taller. 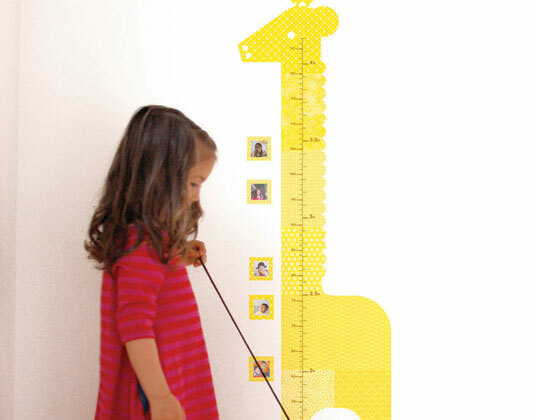 Keep track of every inch with one of Petit Collage‘s newest offerings — growth chart wall decals. They’re made in the USA from fabric, not vinyl, making them an eco-friendly choice that you can remove without damaging your walls once your kid grows up. Choose from a giraffe or a more elaborate tree, which comes complete with birds, apples and 46 leaves to stick. Like some of our other favorite goodies from Petit Collage, these growth charts are created using patterns reproduced from the company’s vintage wallpaper collection. Time flies when your tot is growing taller. 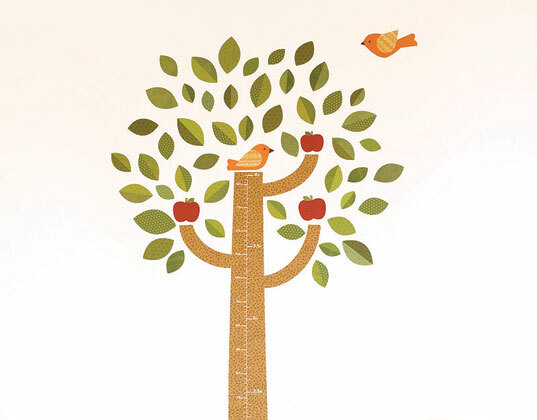 Keep track of every inch with one of Petit Collage's newest offerings -- growth chart wall decals. They're made in the USA from fabric, not vinyl, making them an eco-friendly choice that you can remove without damaging your walls once your kid grows up. Choose from a giraffe or a more elaborate tree, which comes complete with birds, apples and 46 leaves to stick. Like some of our other favorite goodies from Petit Collage, these growth charts are created using patterns reproduced from the company's vintage wallpaper collection.